Your teeth need proper care if you want them to last a lifetime. Here at Short Pump Dental in Henrico, VA, we have the tools and the skills to help you. Our Drs. Roman T. Haueis and William T. Lucas serving their Henrico patients and proudly offer comprehensive, first-rate dental care. While some amount of tooth wear is normal and comes with age, many people don’t realize how much they are wearing down their teeth more than need-be every day. Abrasion: When teeth and other materials interact, teeth are rubbed and scraped, causing abrasion as the result. Dental abrasion is most commonly caused by traumatic toothbrushing, meaning that during brushing, you are applying the toothbrush with too much force. Dental appliances such as retainers can also abrade teeth, as well as diets loaded with foods like sunflower seeds and nuts, as well as nail-biting. Abrasion affects the root surfaces of your teeth just below the gum line as well as the enamel above the gum line. Attrition: Dental Attrition is a type of tooth wear that is caused by tooth-to-tooth contact, which happens many times throughout the day as you bite and chew food. This results in damages to your teeth such as loss of tooth tissue, which usually starts at the incisal or occlusal surfaces. People who clench and grind at night are much more likely to show more effects of attrition, and their teeth can be subject to 10 times the force of those who don’t clench or grind. 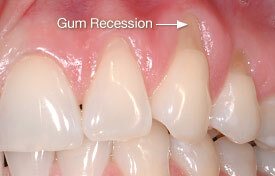 Erosion: Dental erosion is the loss of tooth enamel caused by acidic substances in your diet. Enamel is the protective coating on your teeth, and acid that you consume can actually dissolve the enamel on your teeth, exposing the dentine underneath and possibly leading to sensitivity and pain. Examples of acidic foods in your diet include fruit juices, sodas, and sports drinks. Swishing water in your mouth after drinking acidic substances and confining these drinks to mealtimes can help to prevent erosion. Abfraction: Dental abfraction refers to the loss of tooth enamel specifically at the necks of the teeth (the part directly at the gum line). This type of wear is not clearly understood, but it is believed to be caused by forces from biting. Both abrasion and erosion can also contribute to this problem. 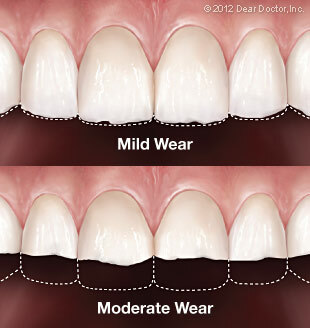 Treating Worn Teeth: Here at Short Pump Dental, our doctors are trained to be able to figure out the root cause of your specific wear. We may ask to perform a simple oral examination and after figuring out what the cause is, we can effectively treat your teeth. Alongside treatment, we can help you reduce the stresses on your teeth to help you best protect them in the future. Whether it is your diet, your brushing habits, or grinding, we can help you move forward and promote the health of your smile. If we need to replace some of your tooth structure so that your bite functions properly, we are happy to do that for you as well. Your beautiful and healthy smile is our priority! Our hard-working doctors and their wonderfully helpful team are here for you and happy to help with your dental needs. If you have any questions or concerns about the wear of your teeth, or if you are ready to schedule an appointment with us, feel free to give us a call at (804) 747-0116 or fill out an appointment request here. We are fully equipped to help you and would love to be your new go-to dental office.